The part of the hops plant that is used is strobiles: female flower clusters. The first time I tried hops, I had no idea what I was getting into. I bought a pound or so of the flowery-looking strobiles from Barefoot Botanicals, a nearby farm that grows them. I knew they were a strong herbal sedative, and I was eager to try them out. I brewed up two cops of hops tea while my roommate started a fire in the wood stove. I put three strobiles in each of our mugs. I brought the mugs to the couches near the wood stove. We sipped. The infusion was very bitter and floral, like drinking a strong IPA but without the fermented taste of alcohol. It was lovely. We sipped and sat, enjoying the fire and chatting. Slowly, our conversation eased into the deeper realms of life and love. My mind felt like its cap of constriction had been lifted, leaving me feeling light and my words flowing without inhibition. It was as though I had taken a truth serum. I sunk deeper into the couch cushions, my entire world occupied by the fire and our conversation. My roommate was feeling the same effects. We talked for hours, until the fire was low and we couldn't deny that it was time to go to bed. Hops have a bitter, floral flavor that is quite lovely. What had happened to us? The next day I did some research. 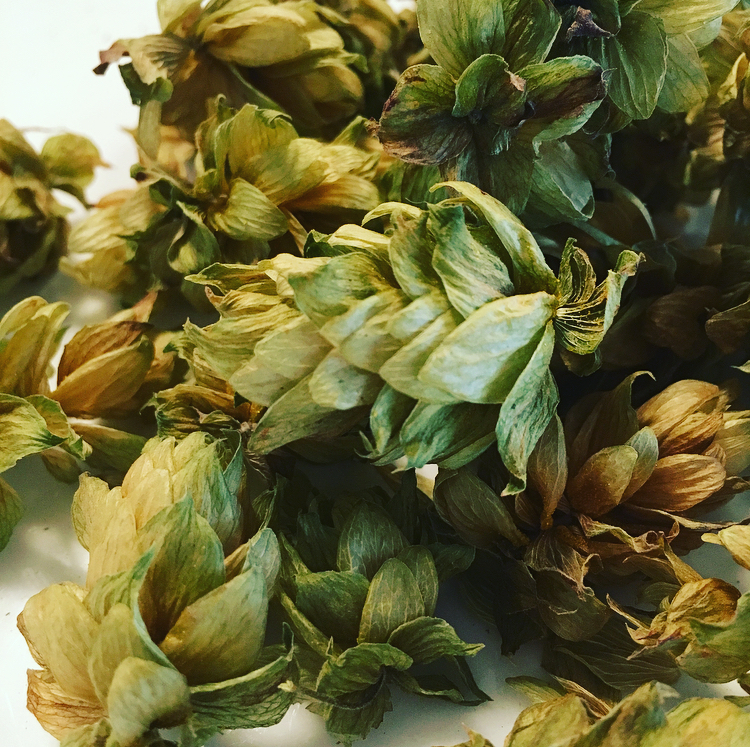 It turns out that hops are known for having a hypnotic effect that is connected to their power as a sedative. Hops can relax the mind so strongly that you can move past inhibitions in a similar fashion as when you drink alcohol. This effect also helps to quell anxiety and to calm cyclical thinking when it's time to wind down for bed. Since that night, I've come to enjoy hops tea regularly. My favorite way to enjoy it is by adding one strobile to looseleaf earl grey. The floral flavor complements the earl grey well. I've grown hops myself, and I love their winding, gripping bines that climb wires and poles. My favorite way to connect with hops, however, is by smoking them. Hops can confer the same hypnotic and sedative qualities when smoked. I don't recommend smoking them on their own; they can be very "high pitched" and send too much energy to your head. I prefer smoking them in a blend, which is why I've blended them into my SOOTHE Herbal Smoking Blend. Check out our first-of-its-kind online course all about smoking herbs — from how to pack a pipe, to which herbs are best for smoking, to using smoking as a ritual, it’s all there.